The timeshare resort of Westgate South Beach is located just blocks from the South Beach/Art Deco District in Miami Beach, and features 46 stylishly decorated villas. 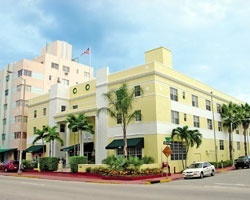 The resort's architecture follows the art deco style, with bold geometric forms complemented by unique details, such as classically trimmed lamp stanchions. The pastel colors and tropical landscaping make it distinctly South Florida. The one-bedroom villas accommodate four people comfortably, while the two-bedroom villas accommodate six people with a separate guestroom. Both floorplans feature a fully equipped kitchen, full-size bathroom, and central heat and air. Guests also enjoy an outdoor swimming pool, direct beach access, a children's playground, and volleyball court. New to Westgate South Beach is Primo Café & Market Located adjacent to the lobby, Primo's serves breakfast, lunch, and dinner daily. They also offer groceries, beer, wine, beachwear, jewelry, and much more!